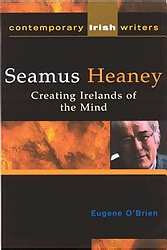 A fresh and comprehensive look at Seamus Heaney's work. Part of Contemporary Irish Writers Series. This study of all of Seamus Heaney's work to date: poetry, prose and translations traces his development from an acceptance of the givens of Irish society, in terms of politics, culture, nationalism and religion, to a more complicated and ongoing critique of these givens. It also parallels this process of development with that of Irish society in general, which has travelled a broadly similar path. It is the intersection of his writing with this societal development that makes Heaney such a central figure for any study of contemporary Ireland. Heaney's work develops the process of moving from an inward looking preoccupation with history, the past and racial memory, to an outward looking mindset directed on the present and future. The recurring themes of digging in memory, the power of language, the interplay between art and politics, and between the individual and the tribe, are examined in detail. Eugene O'Brien is Head of English, Mary Immaculate College, University of Limerick, and is Series Editor for The Liffey Press's Contemporary Irish Writers and Filmmakers Series.